Lake Tarpon Waterfront Estate! Unique 3-story home on 1.2 acres overlooking the west side of Lake Tarpon. This 7+ bedrooms 5 bathroom estate features 7285 sq. 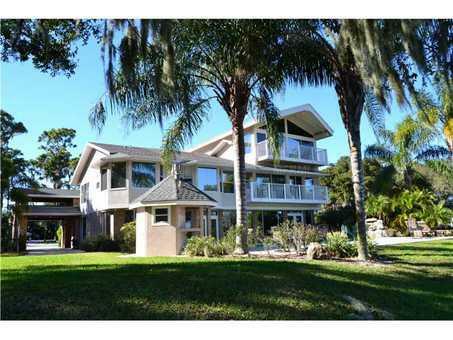 ft. of living space with a sunken great room with panoramic views of Lake Tarpon. The kitchen features granite countertops wood cabinets 2 breakfast bars stainless steel appliances with breakfast nook and a formal dining room all this on the first floor! Along with a billiards room half bath laundry room fitness room and a 1 bedroom/nanny's quarters or in law suite. The second floor has 6 bedrooms or possibly 3 suites with wood floors throughout walk in closets 3 full baths living/entertainment room with built in office/bar area with sink separate loft area/office or sitting area with built in fish tank. The third floor (1100 sq.ft.) is the master suite with a kitchenette 2 walk-in closets oversized his and hers bathroom Jacuzzi tub and walk in shower. Breath-taking views from almost every room of the house! Open pool with spill over rock waterfall and outdoor kitchen and bathroom! Situated on the end of the street with a private gated driveway! Oversized lot with plenty of room to roam wild or possibly add a basketball/tennis court! 115 feet of private shoreline that includes a dock and covered boat lift! Lake Tarpon is one of the largest ski lakes in the area and one of the largest bass fishing lakes in Florida.